This article chronicles the author's experience before, during and after all LASER or Intralase LASIK surgery. Unlike other patient testimonials, the author will objectively outline how this elective procedure has enhanced his survival abilities...shooting, swimming and general adventuring. This is not an endorsement of any medical procedure. It is only the author's perspective on his experience. Please do your own extensive research before deciding on any elective surgery. According to the National Eye Institute the number of Americans suffering from Myopia (nearsightedness) in the 1970's was 25%. 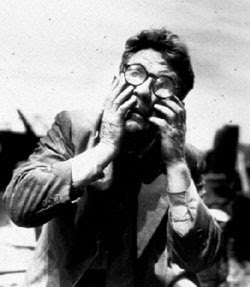 Today you may be alarmed to discover that the number of American's suffering from Myopia is a whopping 41%. Many can debate as to the cause, i.e genetics or maybe reading this Survival Think Tank article on your computer screen? If you currently have a need to use corrective lenses for your every day vision requirements, you may want to consider laser vision correction surgery. If you have never heard of IntraLASIK, please point your browser here for a quick primer. As a military aviator the author of this article was recently recommended to participate in a study to determine the effects of "All LASER or Intralase LASIK" on military aviators. PRK was a viable option but according to the hard statistics in this particular case, a better chance at 20/20 may be realized with current All-LASER (IntraLase) LASIK technologies being deployed by U.S. military aviation medicine. In addition to the official medical study, the author was also concerned with the growing possibility of a total economic collapse brought on by the decline of the U.S. dollar, soaring unemployment or underemployment, shadow real estate inventories or a possible Black Swan event (terrorist attack, major natural disaster, flu pandemic et al). In the post-economic collapse environment you will have to live with what you have. There will be no opthamologist to perform refractive surgery, no optometrists to conduct eye exams, and no factories to fill eyeglass or contact lens prescriptions. Some of you may depend on your corrective lenses to function. Some of you may not even be able to see your alarm clock in the morning without your corrective lenses. Imagine not having access to these lenses when the SHTF? What would you do in a post-collapse environment as a blind man or woman? The time to prepare for this is now, not after a systemic collapse of society as we know it. The following is the author's experience as it happened(s) during his LASER refractive surgery experience. This article will be updated as more data becomes available. In the beginning of my path to LASIK surgery, I was told to remove my contact lenses 14 days prior to my preoperative exam (Preoperative appointment minus 14 days, surgery minus 28 days). Preoperative Appointment (Surgery minus 14 days) - I arrived at the military medical facility at 0800 on the morning of my preop. I was told not to wear contact lenses for 14 days prior to this appointment. I followed those instructions religiously without cheating. Wearing contacts could reform your corneal surface and mess up your testing. Listen to your doctor. Chances are, he's smarter than you on the subject of eyeballs. The tests conducted were extensive. They measured the thickness of my cornea with a handheld electronic device. They took about 50 photos of my eyes and probably more than that. They constructed a 3D image of my eye and mapped the thickness across my cornea. They dilated my pupils and looked inside to determine eye health. It was at this appointment I was told that I would be an excellent candidate for all-laser (IntraLase) LASIK. Informed Consent (S - 7 days) - On this day I was briefed for hours on all the statistical data available on LASIK to include possible flap complications and all possible problems that could happen. I was also shown the laser device and explained about the advanced system that would cut the flap and correct my vision. In the past, surgeons cut the corneal flap with a steel blade known as a microkeratome. This is still performed today, but the military always uses the most advanced and current technology approved by the FDA on their special forces and aviators. The flap-cutting laser at my military treatment facility is only 1 of 30 in current existence in the United States. 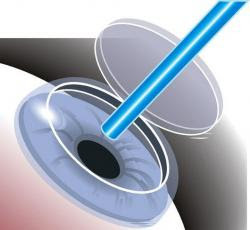 It cuts the flap to fit back down on the cornea like a "manhole lid" making the healing process faster as well as decreasing the chance at any flap problems in the future. After being fully informed of the procedure, benefits, drawbacks and potential problems I was given paperwork to sign as well as my prescription medications for the surgery. I was given PRED FORTE (steroid drops) to start the day before surgery. I was also given antibiotic drops to guard against infection post-op, and wetting drops. I was given a prescription for Restasis to pick up the day of surgery. I was given UV sunglasses as well as sleeping googles to keep me from rubbing my eyes in my sleep. I was told to be very careful post-op not to rub my eyes or take showers with high water pressure for the first week until my eyes could heal. All-LASER (IntraLase) Surgery Day (S + 0) - Everything went great! From the time I walked into surgery to the time I walked out was 45 minutes. After walking into the administration room adjacent to the operating room I went over my information. They asked my name, rank, SSN, date of birth and what procedure I thought I was having today. I answered the questions and they verified all the data. I could hear the guy in front of me (I was the second LASIK operation of the day) talking and answering questions during his surgery. He kept saying things like, "wow, this is weird" and "I can smell my eyes burning." It was sort of strange hearing the guy talk about his procedure while it was happening in real time. After he was done, he walked out and looked at me and said, "Piece of cake dude!" I laughed and the doctor called me into the operating room (where the big lasers were). He again verified my name, rank, SSN, DOB and asked me what procedure I thought I was having that day. He verified everything and then took another look at my eyes to verify everything yet again. He put some numbing drops in my eyes and told me to relax. AFter this he had his assistant put me in horizontal position below the two laser machines that would be involved in my surgery. The assistant handed me a couple stress balls, one for each hand. The doctor then carefully and methodically explained to me EVERYTHING he was about to do, before he started. He placed a few more drops in my eyes, and then marked the surface of both of my corneas to make sure he had cornea flap placement taken care of. 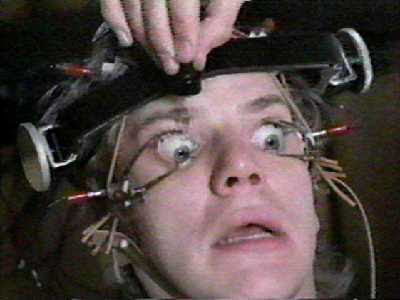 He then gave me the Clockwork Orange treatment and used some serious tape to hold my eyelids open. He placed a suction ring on my right eye and applied some pretty respectable negative pressure to the suction ring. Of course he explained everything before he did it. The suction ring was pretty darn uncomfortable but I would not call it painful. You just wish it wasn't there. After the ring was securely stuck to my right eye, he "docked" the flap cutting laser to my suction ring. He then told me to hold steady and watch the blinking light. I did so and he said, "initiate the procedure." What happened next was a little "weird." My vision turned into a milky blur from one side of my field of view to the other in about three seconds. The flap was cut! He then repeated the flap cutting procedure for my other eye exactly as he had done for the first. Then came the flap peel and the laser correction. He used a small instrument to peel back the super thin corneal flap that the laser had just created on both eyes. After the flap was peeled back I was given the actual laser correction treatment. I could hear a series of loud pops. Synchronized with every pop, my vision seemed to get clearer and clearer. The doctor said, 3, 2, 1 and then no more popping sound. He swiveled the machine away from my head and began to reposition the flap back over my eye. He applied a liquid of some sort, replaced the flap and then used a "squeegee" type device to ensure the flap was replaced properly. This was repeated for the other eye. After this, he said, "alright, all done. You can stand up now." I stood up and my vision was all cloudy and distorted but I could tell a definite difference in my vision. He told me to go home and go to sleep and follow the instructions on this piece of paper (that he handed to me). I got back to my hotel room and pulled out the paper. It was printed in a huge font to help folks that just finished their procedure. "One dose of PRED FORTE (steroid) drops every two hours for the first two days and four times per day after, one dose of antibiotic drops every two hours for the first two days and four times per day after, one dose of Restasis drops twice per day until out and then general rewetting drops as needed. Wear the goggles you were supplied when sleeping. DO NOT RUB YOUR EYES! Wear sunglasses with UV protection when outside. No swimming for 30 days, careful with showers." The day after surgery (S+1) - At 0800 the day after surgery I went in for my first check-up. I sat down with the doc and he said, read this line. After reading all the lines he said, congratulations you are about 20/15. I was really surprised that I could be 20/15 that quickly after the surgery. He then looked at my eyes with a few instruments and scanned them to insure everything was in its place. He said, "Make sure you take your drops and wear your eye shields and sunglasses as needed. I think you are going to be very pleased with your results. The surgery was a success." Everything is going great. I'm still taking eye drops (steroid, antibiotic, rewetting) and recovering well. Vision seems sharper today than yesterday. Still wearing safety glasses to avoid any inadvertent eye accidents, i.e. dog scratches, twigs, etc., etc. Vision a little sharper than S+2. More to follow. Expect future updates on how this surgery helped or hurt range scores and general survival preparation activities. The author of this article is an active duty military officer and the subject of a military medical study on the effects of LASIK on active duty military aviators. The author's opinion is his own and not influenced or endorsed by the U.S. government or any private company affiliated with LASER refractive surgery. You are encouraged to do your own independent research before deciding on any surgical procedure. You will be so amazed --- you'll get up from the table and be able to SEE. No glasses. No contacts. Good vibes to the technicians setting up the equipment and best of luck to you! Thanks for the well wishes! They are appreciated. At least you will be fine after the operation. It takes some time to recover. Almost two years post-LASIK and no regrets! Thanks for the comment.